Are you in the market to lease new space to house your business in the Greater Raleigh area; whether you’ve outgrown your old space, ready for a second location, or just starting out in a brand new business? 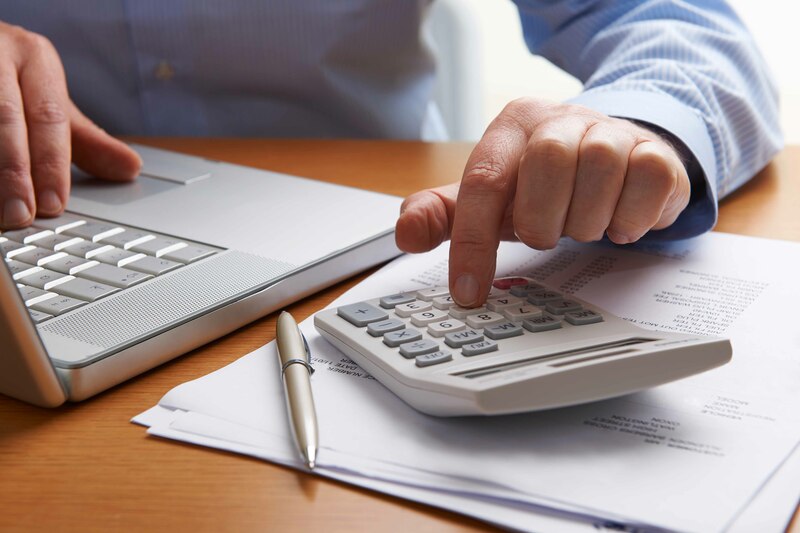 If you are, it will be important for you to understand the terminology and math when calculating square footage and then how that translates to rent or lease payments. So let’s look at 3 factors you will need to become familiar with: Usable Square Footage, Load Factor, and Rentable Square Footage. Partial Floor Tenants: Let’s say you are looking to occupy 2,500 sf of the first floor of a building in order for your business to run efficiently. The first floor has a total of 5,000 sf. Your 2,500 sf of space is considered the Usable Square Footage. This includes any private bathrooms, storage, and maintenance space inside the actual space you occupy. Full-floor Tenants: This would include all the space on the floor because you are occupying the entire floor. It would not include stairwells or elevator shafts, but would include all hallways, lounge areas, kitchen space, maintenance, and storage closets. For our purposes, we are going to use a 10,000 sf building (total sf). We’re also going to say this building has 9,000 total usable square footage, and 1,000 total square footage of common area space. 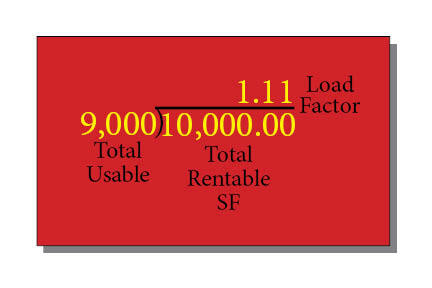 So what’s Load Factor and how is it calculated? Our building has total square footage of 10,000. The total usable square footage is 9,000. 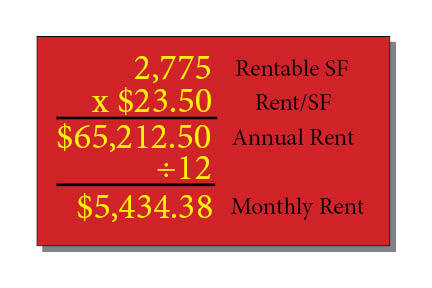 Rentable Square Footage: This is all the total space you will be paying rent on. Take the Usable Square Footage of the space you plan to occupy and add the load factor. It’s that simple. Let’s assume your company requires 2,500 Usable Square Footage in this building. What will I pay per month? How can I compare different spaces? 6,000 usable s. f. X 11 load factor = 6,660 rentable s. f. X $22/s.f. 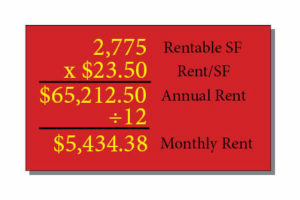 ÷ 12 = $12,210/mo. 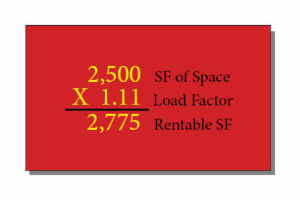 6,000 usable s. f. X 15 load factor = 6,900 rentable s. f. X $21/s.f. ÷ 12 = $12,075/mo. 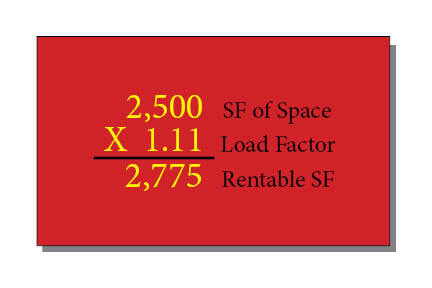 6,000 usable s. f. X 20 load factor = 7,200 rentable s. f. X $20/s.f. ÷ 12 = $12,000/mo. Surprised? The building with the highest load factor and the lowest rate ended up being the less expensive option. It’s important that you look at more than just the price tag. Think about things like how important are the common areas in each building. Do you want a beautiful atrium? Is a common kitchen area important? What value would you attach to such things? And, of course, location, location, location. Proximity to potential clients and also proximity to your employees may be deciding factors. Always read your lease completely and make sure you understand exactly what your dollars are getting you. Do the math and ask questions if something is unclear. It’s best to have a trusted ally to guide you through the process of finding the right space for your business. Our brokers at Craft Commercial are here to share the knowledge they’ve gained through many years of experience in this market. We also have access to private databases not available to the public and can help you search for the best space for your business. We’d love to help you with your space requirements whether you are looking to lease or buy. Let’s talk! Contact us at 919-446-5000 or go to craftcommercial.com. Hello. I have a house and a small portion if land that runs a bit far back and there’s a place of business that is directly behind.they have interest to a portion of it, so that they can expand their parking space. Can you tell me how much I should sell it for.I’m not really sure as to its measurement.but may sufficient to a lot..I would be grateful for any information you can provide.. Your best bet is to contact a qualified commercial real estate broker in your area. They will take a look at your individual situation and make appropriate recommendations given your market. Thanks!